Like the Thistledown this is also a single uni-weight line with mono core. It is a floating line but specifically designed with river nymphing in mind. It boasts a short 6ft front taper, reducing to a fine 0.55mm diameter tip. The long, level belly is a similarly slim 0.65mm diameter, before the matching 6ft back taper to make it fully reversible. Both tapers are high-viz orange in colour for optimum visibility and fine take detection and feel. The reversible double taper line is 75ft in length and is micro-looped at both ends for finesse and immediate use. THE PERFECT LINE FOR CZECH, Polish and French style nymphing.  Ultra-thin, incredibly light line for the utmost in sensitivity.  Highly visible tip for detecting the subtlest of takes.  Approved & endorsed by FIPS Mouche as Competition Legal. 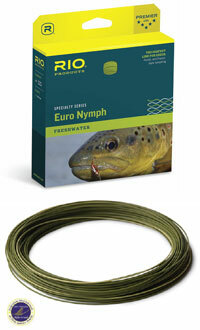 The Euro Nymph line was designed by Steve Parrot to satisfy the need for a one size fits all European style nymphing line that is competition legal. The line is built on a thin diameter, low stretch, supple core to maximise sensitivity and allow for lightning fast hook sets, while a highly visible tip helps anglers detect the slightest of strikes. This line is designed specifically for European style nymphing techniques, such as French, Czech, Polish and Spanish styles.  Conforms to International rules. 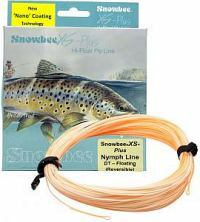 The Euro Nymph line was designed to satisfy the need for a one size fits all European style nymphing line that is competition legal. The line is built on a thin diameter, low stretch, supple core to maximise sensitivity and allow for lightning fast hook sets, while a highly visible tip helps anglers detect the slightest of takes. This line is designed specifically for European style nymphing techniques, such as French, Czech, Polish and Spanish styles.